One of the goals of our ZooCrew education program for middle schoolers is to connect youth to professionals in the field in order to complement their classroom learning and pique their interest in various STEM (science, technology, engineering and math) careers. This summer, tablets generously donated by Washington STEM* helped us do just that. ZooCrew youth collaborate with zookeepers, giving them a positive exposure to careers in science. Photo by Jess Thomas. In August, ZooCrew partnered with a summer camp based in West Seattle, a good 30 minutes from Woodland Park Zoo. We were working on a project that connected the kids back to our animals on zoo grounds—developing enrichment devices to keep the animals stimulated and kickstart their natural instincts. A project like that needs lots of feedback from the zookeepers to make it work, but it would have been a big investment to ask zookeepers to drive out, stay for the program, and drive back — about half a day, on top of the rest of the amazing and generous support they’ve given our youth. However, it was a much easier request to connect the keepers and youth across the geographic divide using tablets. Click to watch video in a new window. Using a tablet, we recorded each youth presenting his or her proposal for an enrichment item. This required them to articulate their idea in a concise and intelligible way—a good middle step between talking to a classmate and presenting to a real audience. For instance, Kimani had to explain his proposal for his enrichment item for his animal, the anoa (see video above). Back at the zoo the next day, I took the iPad to Deanna, one of the animal management team leaders. Deanna watched the recorded proposals, and then I recorded her giving her feedback (see video above). She mentioned what she thought would work with the animal, and what would need to change to make it more suited to the animal’s individual needs. 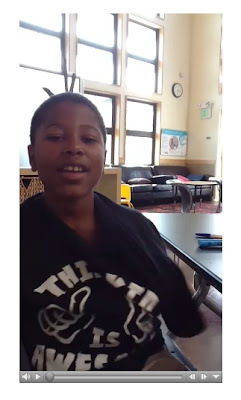 Trevaughn constructing enrichment based on Deanna’s video feedback. Not only did this improve the quality and usefulness of the youth’s projects, but it also allowed zoo staff and our youth to connect with each other through image and sound. Both sides got a chance to introduce themselves and hear from the other. For staff, it put faces to the project they were helping with. For the youth, it showed that there are people at the zoo (beyond me) who are invested in their success and their future. Anoa enjoying the enrichment. Photo by Jess Thomas. Sure, this could’ve been done with a camera. However, the tablet was very well suited for this for a few reasons. First, it allowed me to skip any downloading, uploading, emailing, etc. Second, it allowed me to film and show on site, wherever the youth or managers happened to be. Third, the screen is large enough that you don’t have to squint to see it. And last, there is something nice about holding the tablet in your hands while you watch someone talk to you. Somehow, it increased the feeling of connection. Zookeepers chat with ZooCrew youth about the success of their anoa enrichment collaboration. 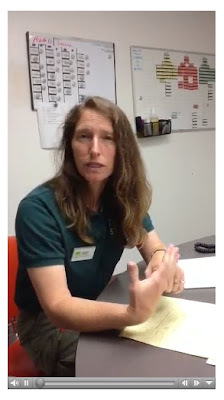 When the youth arrived at the zoo for the capstone to their project—delivering enrichment to the animals--they were happy to recognize Deanna, the very same animal care leader who has given them feedback and encouraged them all along. Deanna was excited to meet the youth and see the projects that she had been helping with. Rather than replacing personal connections, technology actually laid the groundwork for them. *Washington STEM is a statewide nonprofit advancing equity, excellence, and innovation in STEM education. Launched in March 2011 with support from the business and philanthropic communities, they invest in and lift up breakthrough ideas and promising practices that bridge education and our economy through STEM. Together with educators, businesses, and communities, they are reimagining STEM education for every student, improving opportunities for those most underserved and underrepresented in STEM fields. Zoo Crew has been awarded an Entrepreneur Award, given to educators who are pioneering breakthrough ideas and promising practices in STEM education. Photos and video by Rob Goehrke/Woodland Park Zoo unless otherwise noted.